The Samsung Galaxy Note 7 is just the latest item you shouldn't pack in a checked bag aboard a commercial airline in the U.S.
“In light of recent incidents and concerns raised by Samsung about its Galaxy Note 7 devices, the Federal Aviation Administration (FAA) strongly advises passengers not to turn on or charge these devices on board aircraft and not to stow them in any checked baggage,” the agency said in a brief statement. Samsung has recalled the Note 7, its flagship smartphone that was introduced only last month. 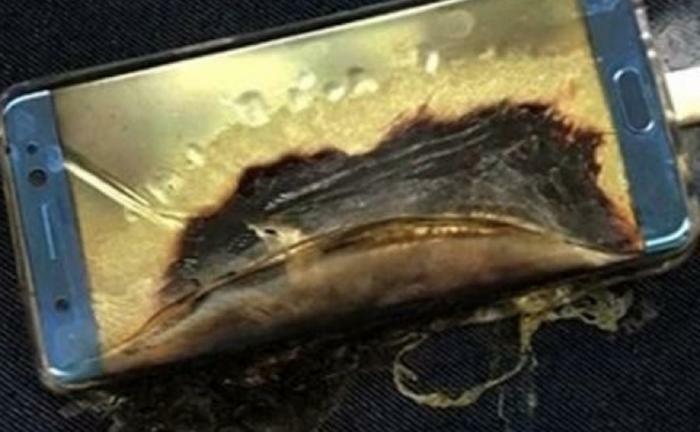 The recall was prompted by more than 30 cases of the phone's battery overheating and catching fire. Anything with a chance of starting a fire is frowned upon at 30,000 feet. The FAA says there are a number of things that are fine on the ground but not in an enclosed space in the air. Others are tightly regulated. Lithium batteries – the kind that power cordless devices like phones and laptop computers are one example. But so is an aerosol can of whipped cream. Both examples are considered hazardous materials and dangerous goods, but are allowed under certain conditions. The FAA's list of hazardous materials includes the obvious, like explosives, gases, flammable liquids and solids, and radioactive materials. But passengers should consult the FAA's list to find exceptions to the rules. For example, most aerosol cans are banned from checked bags but not all. Sun block sprays are allowed. Not all batteries are prohibited either. Small gel cell and absorbed electrolyte batteries for portable electronics can be packed in checked bags. Battery powered e-cigarettes can be carried on but can't be packed in checked bags. Many consumer personal electronic devices containing batteries are allowed in carry-on and checked baggage. Examples include dry cell batteries including lithium metal and lithium ion batteries for consumer electronics. Spare dry cell batteries are also permitted. While the list of permitted and banned items is extensive, the FAA warns that it is not complete. The agency's advice? When in doubt, leave it out. As for the Note 7, Samsung has said it will replace all the phones sold so far, but first must come up with one that isn't a fire hazard. That could take a little time. In the meantime, airline passengers who use Note 7s must keep them out of checked bags and turn them off when they board an airliner.